In the early days of dentistry, people only went to the dentist if they had a problem in need of immediate attention. Regularly brushing was not a standard daily practice until after the first World War. There were no established guidelines for when to visit the dentist, making the doctor’s job mainly to fix tooth and other oral problems rather than prevent them. However, thanks to some clever advertising from a toothpaste company, regular brushing and oral hygiene became a part of our daily routine. So, too, did regular visits to the dentist. It’s recommended by the American Dental Association that you visit your dentist at least twice per calendar year. No matter how steadfast and thorough you may be in your daily home dental hygiene habits, you should still see your dentist at least twice per year for a professional examination. Even if you don’t have any tooth or jaw pain, cavities, chipped or broken teeth, or any other pressing issues that you feel might need professional care, a visit to the dentist’s office for a routine examination and cleaning can help prevent any serious problems from popping up unexpectedly. Early detection and prevention are the top methods for fighting tooth decay and gum disease. The earlier any condition is detected by your dentist, the easier it will be to fix. 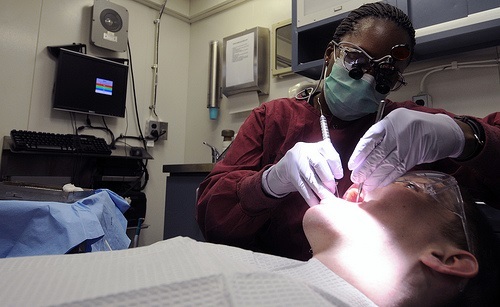 Regular dental exams can help you to avoid any expensive and painful dental procedures in the future. Your dentist will ask a series of questions to assess your overall health and oral hygiene habits. They’ll want to know if you’ve been experiencing any issues with your teeth since the last visit and how often you’ve been brushing and flossing at least twice per day, as recommended. Your dentist will perform a visual examination to ascertain the condition of your teeth. They’ll evaluate for the presence of any tartar buildup or cavities and determine your risk for tooth decay, root decay, and gum diseases such as gingivitis or periodontitis. Your dentist will conduct a cancer screening, examining your mouth, lips, tongue, neck, lymph nodes and throat for any signs of cancer. If anything overly suspicious is found, you’ll be referred to a specialist for further diagnosis. As with any medical condition, identifying any oral cancer in its early stages can be extremely beneficial. Your dentist will evaluate the need for tooth repair or tooth replacement or extraction. The dentist will determine if you’ll need work beyond a simple examination and cleaning, such as the need to have a tooth pulled or a possible filling, crown, or bridge. Your dentist will examine your teeth, bite and jaw for problems, such as improper alignment or grinding. The dentist may take several X-rays of your mouth and thoroughly examine your jaw muscles to determine if there are any underlying problems with your jaw or facial skeletal structure. Your dentist will thoroughly clean and polish your teeth to remove any stains or deposits. Any tartar or deposits that have built up since your last visit can be cleaned off and the teeth will be professionally polished. No matter how thoroughly and regularly clean your teeth at home, they will never be as clean as a dentist or dental hygienist can get them. Your dentist will demonstrate proper cleaning techniques for your teeth and recommend use of oral hygiene products. If you’re dentist doesn’t believe you’ve been keeping good enough care of your teeth between visits, they’ll give you tips to improve your oral hygiene habits. This could include recommending a certain brand or type of toothbrush, toothpaste, or mouthwash. You could even be given a prescription for a special mouthwash or toothpaste. A regular practice of brushing, flossing, and regular dental exams can help make sure you maintain a healthy smile.